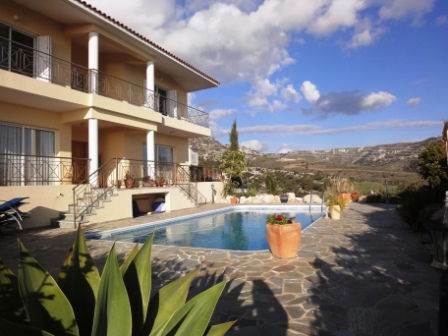 Cyprus Property Blog by Cleo : Peyia Luxury Villa with Amazing Views - NOW SOLD!!! • 239 sq. m., 3 bath, 4 bdrm 2 story	-	€535,000 EUR	- Luxury Detached Villa - NOW SOLD! Peyia, Paphos, Cyprus	- This luxury villa is located in the hills of Peyia, and has the most stunning mountains and sea views. The village with its many local amenities is a few minutes away, and the popular beach of Coral Bay is a 5 minute drive. The open plan living area is particularly roomy and has lots of patio doors, making it a light and airy space. The areas are nicely separated into distinct rooms, with a lounge with fitted gas fire at one end, and a formal dining area at the other. Next to the dining area is the kitchen with granite worktops, breakfast bar and quality appliances including a built-in double oven. Also on this level are additional built-in cupboards for extra storage, a large bedroom with fitted wardrobes which is currently being used as a study and a shower room with vanity unit. Upstairs there are 3 double size bedrooms, all with fitted wardrobes, and a large family bathroom with vanity unit. The master bedroom is huge with an impressive en-suite including corner bath, shower and vanity unit. All the bedrooms, including the landing, have access via patio doors to a balcony with breathtaking views of the sea and mountains. The landing space, being so large, also provides an additional study/office area. At basement level there is access to the garage, which includes a workshop area also. There is an additional room next to the garage, which is currently used as a laundry/store room. Being a 800 sqm plot, there are a number of areas to sit, relax and enjoy, including the pool terrace, and a side patio area with covered pergola - iideal for outdoor dining. The landscaped gardens are terraced and designed to be low maintenance with mature plants and trees. Being elevated above other neighboring properties, the spectacular views can be enjoyed from all aspects of the property.